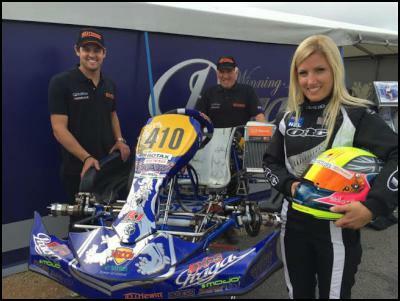 Christchurch-based British female driver Tiffany Chittenden has claimed top ‘Kiwi’ finish at this year’s Rotax Max Challenge Grand Finals meeting in Spain, ending up sixth in the DD2 Masters class. Chittenden, 32, now lives and works (as an advanced driving instructor) here and was one of three drivers from New Zealand to get to the Finals at this year’s rain-lashed Challenge Grand Final at a new kart track in Spain’s Valencia province. Multi-time New Zealand champion, Ryan Urban from Auckland ended up 11th in the same class (DD2 Masters), while 15-year-old Palmerston North driver Dylan Drysdale finished 19th in Junior. Six drivers from the New Zealand Challenge earned places at the this year’s Grand Final – where 288 karters from over 80 national Challenge series around the world meet to contest the annual Grand Final titles over four classes. The other three – brothers Mathew and Daniel Kinsman, and Aarron Cunningham, all from Auckland – were eliminated before the Finals in their respective classes. Changeable weather played a part in proceedings at this year’s Grand Final with the Pre-Finals cancelled and Finals run in the wet. Both Chittenden and Urban did get a break of sorts in the damp Final. After initially crossing the finish line in eighth and 13th places respectively the pair were elevated to sixth (Chittenden) and 11th (Urban) after two of the drivers ahead of them at the line were disqualified after the race for technical infringements. As well as claimed top ‘Kiwi’ honours, Chittenden – who represented Great Britain at the 2007 Rotax Max Grand Finals meeting in the DD2 class – was also the top-finishing female at the meeting. She could well have finished even higher, too, had the rain stayed away. Ryan Urban was also left wondering what might have been after posting competitive times and heat placings in the lead-up to Finals day. Two karts spun in front of him just three corners into the first lap and he got caught up in the aftermath, meaning any chance of a top six placing were gone. He did manage to fight his way back up the field, despite steering damage, but when the flag came out he was just outside the top ten. Dylan Drysdale, meanwhile, shone early on in the Junior Final, getting a great start and in eighth place within sight of the chequered flag before putting a wheel off the track and being shuffled back to 19th place.